A guy comes to a door that says Singleton's Club. Curious, he opens it and enters the room. Five men are seated around a table. The first has just one arm, the second one leg, the third one ear, and the fourth one eye. The fifth man looks perfectly normal. What's going on? 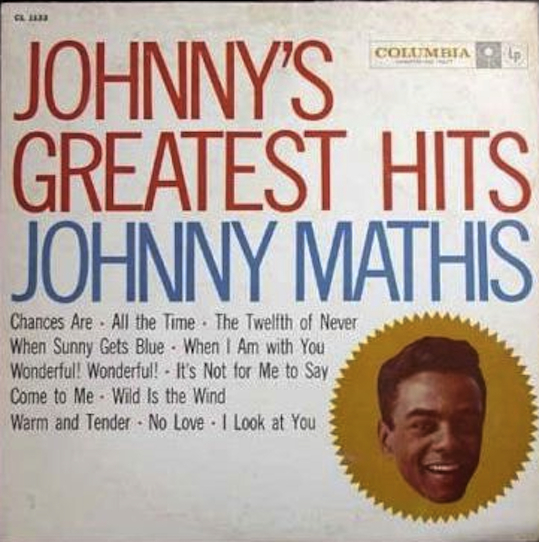 It is a generally accepted fact that it was Columbia Records' executive Mitch Miller's idea to do the first "greatest hits" album, by Johnny Mathis, appropriately titled Johnny's Greatest Hits (pictured). 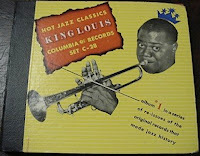 Released early in 1958, over one million copies of the album have been sold, earning it a "Platinum" designation. According to Joel Whitburn (The Billboard Book of Top 40 Albums, Revised & Enlarged 3rd Edition, 1995) Johnny's Greatest Hits remained on the Billboard album chart for 178 weeks--in other words, for about three and a half years. Sales of the record may, in fact, have been much higher than one million copies, as the Record Industry Association of America (RIAA) didn't begin certifying platinum albums until 1976. I've been thinking about the concept behind the "greatest hits" album as a consequence of my previous post on the reissue. As I indicated yesterday, while Milt Gabler pioneered the reissue in 1934 by licensing from the American Record Company the masters of early jazz records for his independent (as opposed to "major") Commodore label, it was George Avakian at Columbia Records--incidentally, it was he who apparently signed Johnny Mathis to Columbia in the mid-50s--who with a series of reissues beginning in 1940 provided the first outline of a primary jazz canon that influenced the writing and thinking on jazz for the next several decades. 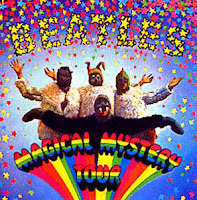 Having thought about the idea of the reissue for the past couple of days, I have concluded that the "greatest hits" album is merely another name for a reissue: like the reissue, it is both a retrospective and also promises nothing but the canonical recordings--the proverbial wheat separated from the chaff. 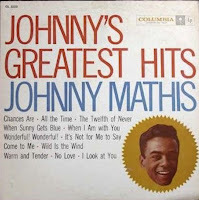 In the case of Johnny's Greatest Hits, it cost Columbia Records nothing to (re)issue and had the additional benefit of making the company pots of money. Obviously the music industry is a complex, profit-oriented institution. Executives at Columbia Records learned from the earlier Hot Jazz Classics series of reissues that rather than to ignore its back catalog and lease those masters to indie labels, it should transform its back catalog into yet another revenue stream--but call it "greatest hits" rather than a reissue. True, "greatest hits" suggests a form of endorsement by the tasteless mob ("popular") rather than the "critical" form of endorsement coming from an informed "specialist," but the latter form of approbation suggests the elitist judgment of the snob, to be avoided at all costs. A "greatest hits" album thus has populist appeal. Moreover, a "greatest hits" album has the added advantage of thinking for, and then fulfilling, the desire of the masses for a definitive collection: in a "greatest hits" package, prescience is combined with efficiency. Rather than a disorganized mess of scattered and noisy 45s or a bunch of LPs, the "greatest hits" album collects the canonical songs--all the songs "that matter"--into one slick, convenient, inexpensive bundle. 1. The past and present catalogs of all of the major music labels are one vast (but hugely intimidating) database. Apple's iTunes recognizes this to be true, and has exploited it for profit. The iTunes database holds the promise of someday being like the mind of God, holding all possible musical tracks within it, the sum total of all music ever recorded, and hence the potential of fulfilling every potential desire. Scarcity (rarity), a sad indicator of corporate inefficiency, shall someday be a thing of the past. 2. We must acknowledge that music, like bricks, is the result of sophisticated technology subjected to human will, an industrial product, and hence is a commodity that is manufactured and sold. Apple's iTunes also recognizes this to be true and holds the promise of (someday) holding the largest possible selection of bricks made, offering all optional colors and textural variations, a veritable cornucopia, the superest of all superstores. 3. All human technologies seek to perfect ("improve on") nature. Bricks, made to be sold, are stone perfected. "Greatest hits" packages improve on the imperfect state of nature, offering the typical (the non-specialized) consumer a basic set of solid, widely-endorsed, time-proven bricks at a reasonable price. Even "Greatest Hits" albums are available on iTunes. Addendum 12/30/10 5:07 p.m. -- According to Adam White, The Billboard Book of Gold & Platinum Records (1990), Johnny's Greatest Hits was certified " Gold" on 6/1/59, and certified "Platinum" on 11/21/86. According to this site, a reissue is “the repeated issue of a published work,” and is also known as a “re-release” or “re-edition.” But what is the history of the reissue? When did the practice begin? Why? Under what circumstances? Obviously a reissue is one of those special cases when a verb is used as a noun: the action of reissuing creates a reissue. Walter Benjamin (“The Work of Art in the Age of Mechanical Reproduction”) might say that the reissue is a consequence of modernity’s many tools for mechanical reproduction, and hence represents the process of the democratization of art. Bruce Boyd Raeburn (New Orleans Style and the Writing of American Jazz History, University of Michigan Press 2009), indicates that the practice of reissuing started during the Great Depression, when in 1934 Milt Gabler negotiated a leasing arrangement with the American Record Company (ARC) — which controlled the masters of the moribund OKeh, Brunswick, and Vocalion labels — and reissued some early jazz recordings on his Commodore label. 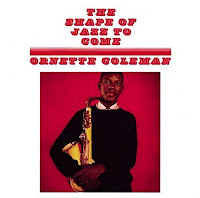 The next year he formed the United Hot Clubs of America (UHCA) and reissued 57 jazz classics on the label over the next five years. One might generalize by saying the technique of reproduction detaches the reproduced object from the domain of tradition. By making many reproductions it substitutes a plurality of copies for a unique existence. And in permitting the reproduction to meet the beholder or listener in his own particular situation, it reactivates the object reproduced. These two processes lead to a tremendous shattering of tradition. . . . Instead of being based on ritual, it [art] begins to be based on another practice--politics. Or, to use Derridean language, a reissue is a “citation” grafted into a new context and, as an inevitable consequence, refunctioned. When Columbia reissued these four albums beginning the spring of 1940, the cornerstone of the jazz canon was laid. Following the reissues of Bix Beiderbecke, Bessie Smith and Fletcher Henderson were albums on Duke Ellington (#5) Earl Hines, and Frank Teschemacher (#7). Other reissues followed, and so the past became present. The reissue, a consequence of mechanical reproduction and all that it implies, thus gave birth to the audiophile, one who philosophically adheres to the hierarchy of original and copy and who therefore denounces the copy in the name of the original, and the collector, one who exhibits the will to omniscience and has taken up the aural equivalent of the hobby of trainspotting. [The film] intercuts scenes of life in Chicago’s black neighborhoods with interviews with interracial artists and intellectuals. ‘[The] Cry of Jazz’ is a historic and fascinating film that comments on racism and the appropriation of jazz by those who fail to understand its artistic and cultural origins. As has been the case since the Fifties, jazz is once again portrayed as the kind of music that seems to hold a special appeal to snobs and elitists (“intellectuals”), especially so to those preoccupied by “its artistic and cultural origins.” I’m not actually disputing this characterization of the film since the argument of the film relies upon the foundational myth of popular music, the distinction between the authentic and the commercial (or inauthentic) and the various guises this distinction takes: innovation vs. popularization, black vs. white, jazz vs. rock, and so on. The way this opposition works itself out, as Michael Jarrett has written, “Hot jazz turns to swing, bop turns cool, eroticism turns to lassitude, black bleaches to white, the dirty gets laundered, and the uneven is worn smooth: the structure of this apocalyptic sequence reproduces itself any number of times in accounts of American popular music since World War II” (Sound Tracks 191). As Jarrett also observes, this authentic vs. commercial model seems ontologically stable to us “because it explains what Andrew Ross calls ‘the everyday, plagiaristic, commerce between white [“commercial”] and black [“authentic”] musics’; it conceptualizes the history of American popular music as a series of unilateral, commercially driven energy exchanges that everywhere bespeak ‘a racist history of exploitation exclusively weighted to dominant white interests’…” (191). Perhaps the film’s greatest failing, however, is that its provocative declaration “jazz is dead” is actually an admission by the filmmakers that they cannot account for future jazz innovation. 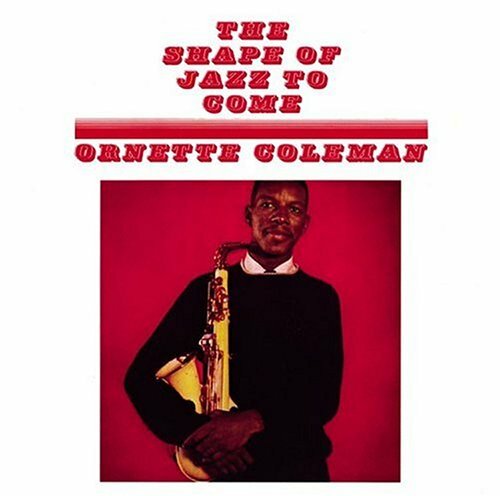 Shot largely in 1958, released in 1959, the irony is that about the time the film was released (rather limited, so I understand), Ornette Coleman and his associates began to pioneer harmolodics—a move beyond the lead/rhythm opposition which had structured all jazz improvisation up to that time—with albums such as The Shape of Jazz to Come (1959), the title of which uncannily seems like a rejoinder to the "jazz is dead" argument in The Cry of Jazz. I should note that the Library of Congress admits that the goal of the registry is not to identify the best movies ever made but to preserve films with artistic, cultural or historical significance. Historically considered as a pre-Civil Rights Era documentary, The Cry of Jazz would seem to be an appropriate choice for inclusion in the Registry. Among the many nice gifts I received for Christmas this year were two Elvis CDs containing rare outtakes, one titled '60-'61 Sessions and the other Elvis Presley - Vol. 3: Blue Hawaii Outtakes. I'll report on the CD containing the Blue Hawaii outtakes later (it's been around awhile, indicating a copyright of 1991), as I haven't yet had a chance to listen to it, being preoccupied by the '60-'61 Sessions disc containing 33 alternate takes from the years 1960 and 1961 that, according to the disc packaging, have not been released on the Follow That Dream (FTD) collector's label. More on this later. Obviously the majority of the tracks are from 1960, confined to the first RCA Studio B Nashville session from March 20-21, 1960 ("Fame and Fortune"), soundtrack sessions for Paramount's G. I. Blues (April 27-28, 1960) and 20th Century-Fox's Flaming Star (August 8, 1960), and the His Hand In Mine Studio B Nashville session from October 30-31, 1960. The remaining four tracks are from the March 12-13, 1961 Studio B Nashville session that formed the basis of 1961's Something For Everybody ("Sentimental Me," "There's Always Me," "Put the Blame On Me," and "Starting Today"). 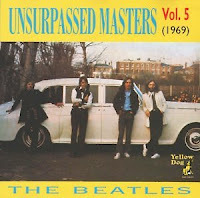 Hence the contents of the disc are rather nicely confined to material recorded from March 1960 through March 1961, with the emphasis on material recorded March - October 1960. 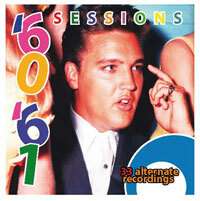 If one were to combine the outtakes on the '60-'61 Sessions with those on the FTD releases Fame and Fortune (2002) and Long Lonely Highway (2000) and those on the FTDs of Elvis Is Back! (2005) and Something For Everybody (2006) (excluding the singles), as well as most of the tracks on Such A Night: Essential Elvis Volume 6 (2000) and the first few tracks found on disc 2 of Collector's Gold (1991), you'd have an excellent representation of the first calendar year (March '60 - March ' 61) of the post-Army Elvis, a very good musical period indeed. To fill out the recordings for this year, one would also have to add the FTD releases of Wild in the Country and Blue Hawaii as well as the 1997 RCA Europe import CD of G. I. Blues, which includes several alternate takes. The unused "Black Star" as well as other soundtrack recordings from this period can be found on disc 1 of the aforementioned 3-CD box Collector's Gold. While the so-called "smoother" sound of Sixties Elvis starts to emerge with songs such as "Fame and Fortune," the excellence of the Elvis Is Back! (produced by Steve Sholes and Chet Atkins) and Something For Everybody (Steve Sholes) sessions is undeniable. (For a discussion of the Chet Atkins' "smooth" or "Nashville sound" emerging at this time which influenced the production of the music Elvis recorded during this period, I'll refer readers to an earlier post found here.) Obviously the "journey" of the Sixties Elvis begins with these fine 1960-61 recordings, but the excellence of his non-soundtrack recordings diminished in the mid-60s as the movies (and their soundtracks) began to take more and more of his time and energy: notice that he made four movies the first year after he was discharged from the Army. However, the worst of the movies Elvis made in the 1960s--in my opinion, Kissin' Cousins, released in 1964--was yet to be made, but unfortunately it was released the month following the Beatles' first appearance on The Ed Sullivan Show, and the rest, as they say, is history. Perhaps it is no coincidence that the biggest hit record Elvis had from 1964 to 1967 was "Crying in the Chapel," recorded in 1960. 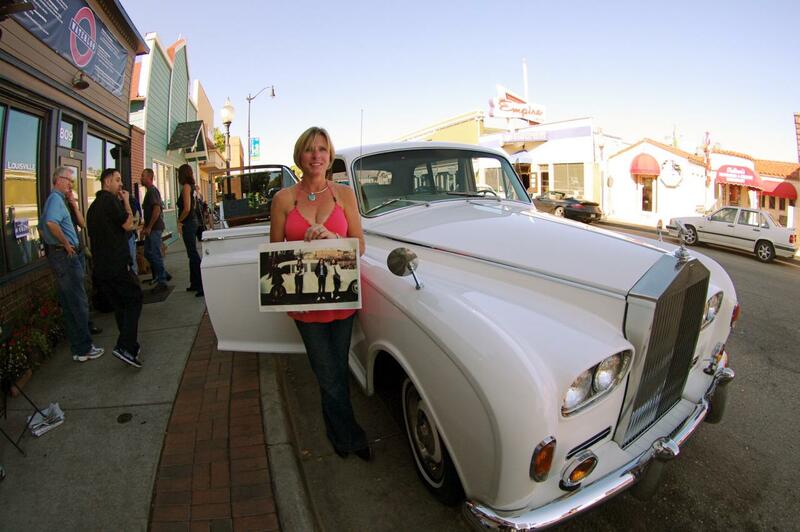 The mystery of the disposition of John Lennon's white Rolls Royce remains unsolved. Despite the recent 30th commemoration of Lennon’s assassination, we still aren’t sure of the exact whereabouts of John and Yoko’s white, 1965 Phantom V, or who owns it. To the best of our knowledge, there are at least three contenders, all of whom are based in the United States. One is doing time in a Californian prison; one is a legal attorney in Pensacola, Florida; and another is a property developer/car enthusiast in Colorado. Phil Spector has never claimed to be the owner of EUC 100C. As we have seen, he just happens to have in his garage a white Rolls Royce of similar vintage to John & Yoko’s famous limousine. The only evidence in this line of inquiry is Alan White’s widely published recollection of Lennon offering Spector the keys to his white rolls at the end of the Imagine sessions in mid-1971 (see the previous blogs below on this issue). However, as Mick Brown has commented elsewhere in this blog, Spector would not have neglected to mention during the course of Brown’s interviews that his white Rolls was a gift from John Lennon. It would have been a talking point early on in the conversation, which took place in 2003. Yet another white Rolls Royce purporting to be Lennon's former limo is featured on Flickr, parked on Main Street, Louisville, Colorado, USA. (http://www.flickr.com/photos/18767293@N00/sets/72157622341089611/detail/). 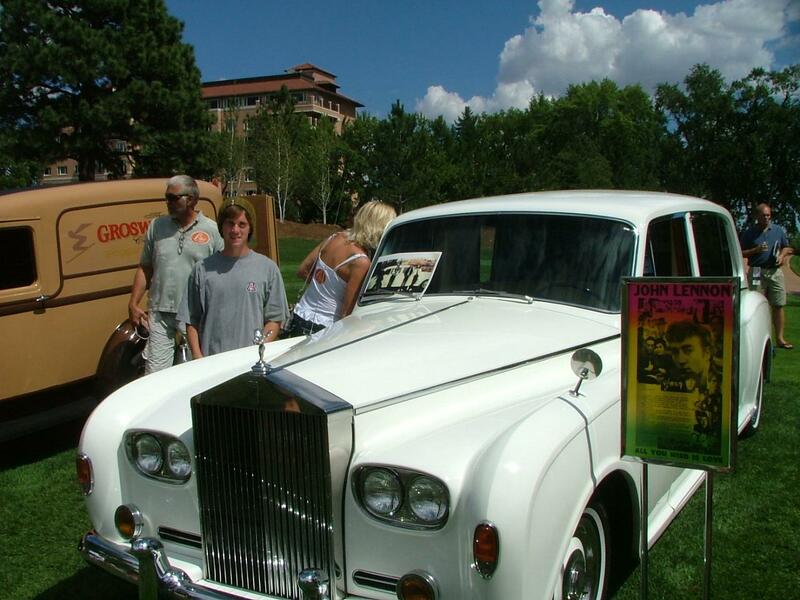 At this stage, the leading protagonist in the white Roller saga has to be property entrepreneur and philanthropist, Stephen Tebo in Colorado. A recent contributor to this blog supports this hypothesis (see comments on the white Rolls posted on this blog). 1965 Rolls Royce Phantom V Limousine By H. J. Mulliner, Park Ward design 2003 5VD63, delivered May 65 to to Patrick Barthropp Ltd., registered PPB1, and used in the movie Georgy Girl (UK, 1966), and subsequently by the Beatles. So not ordered new by Lennon. You can be certain of one thing: whoever the real owner of EUC 100C is, providing they can establish the car’s provenance, they are sitting on a multi-million dollar investment. Its more famous, but by no means more significant black twin, FJB 111C, sold for nearly three million dollars 25 years ago. Ideally, however, John and Yoko’s white Rolls Royce should be on display in a major museum, preserved as an integral part of Beatle history.